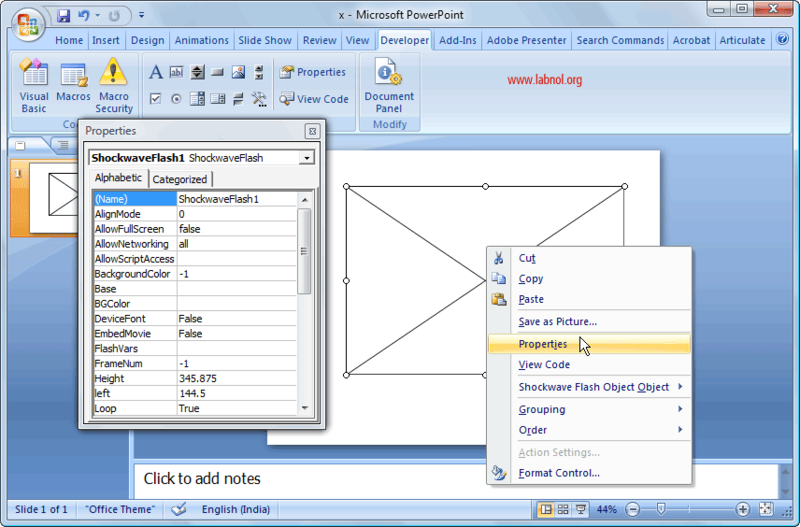 Learn how to how to embed a Macromedia Flash animation (or any swf movie file) into your Microsoft Office PowerPoint 2007 presentations. You will able this play this PPT slideshow on any computer that has Adobe Flash Player installed. These instructions for adding Flash files use the PowerPoint 2007 fluent ribbon interface but can be applied to previous version of Microsoft Office as well like 2003 or XP with slight modifications. Step 2: Click the icon in the Developer Tab that looks like a tilted hammer (highlighted in red) and select Shockwave Flash Object from the next window. Step 3: Draw a rectangle using your mouse on the PowerPoint canvas, right click and select Properties. Type the full location of the SWF file in the Movie Property – the Flash swf file could be in some folder on your hard drive or you type type a web address (URL) of a swf files that’s available online. Step 4. If your SWF file contains an animation and you want that to play as soon as the PowerPoint slide is viewed, set Playing=True. Similarly if you want to prevent the Flash animation from entering a loop, set Loop=False. You are almost done. If you want to insert another Flash movie in the same presentation, insert a new slide and repeat the process. Press F5 to test the embedding. Troubleshooting: If the SWF Files are not playing, chances are that you haven’t set the right security setting in the Trust Center to play Active X Control.